At RGV Cosmetic Surgery & Vein Center, we offer a number of advanced male plastic surgery procedures. Dual board-certified plastic surgeon Filiberto Rodriguez, MD, FACS offers his services to men residing in and around McAllen, Brownsville, the Rio Grande Valley, and all of South Texas. Plenty of men consider plastic surgery, but many do not go through with it because they feel it is uncommon for men. On the contrary, Dr. Rodriguez performs countless male plastic surgery procedures. Men who wish to resculpt their body contour or reduce the appearance of imperfections in certain features may benefit from plastic surgery. 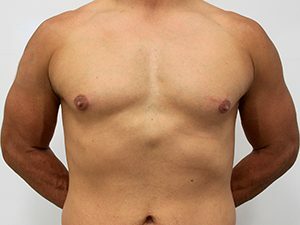 For example, we offer gynecomastia surgery to help men who wish to reduce the appearance of male breasts. 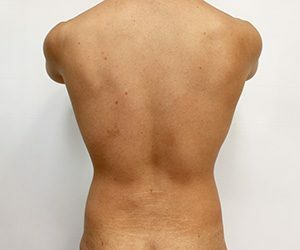 We also offer a variety of body contouring procedures, such as liposuction and body lifts, to help tighten lax skin, reduce unwanted fat, and define the natural body contour to provide a more masculine appearance. The following before-and-after pictures display various male patients who underwent plastic surgery at our facility. Our images are never edited or retouched. 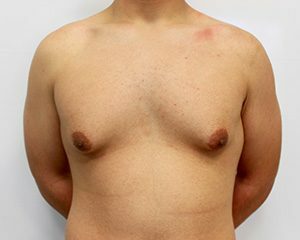 This 25 year-old man from the Edinburg, Texas area presented to my plastic surgery clinic with concerns regarding gynecomastia. He is 6’0” and weighed 214 pounds. 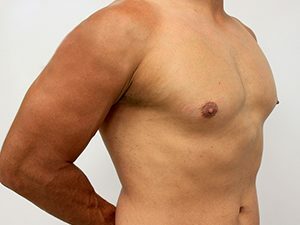 On examination he had moderate to severe skin excess with palpable fibrous breast tissue (Grade III – IV gynecomastia). 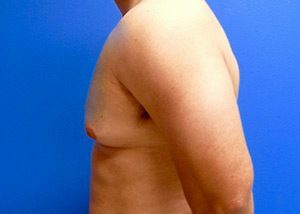 He was very self-conscious as a result of his gynecomastia, and he sought definitive treatment. 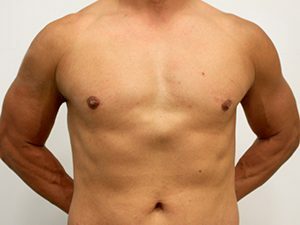 We discussed the fact that he was not a candidate for treatment with VASER liposuction alone. 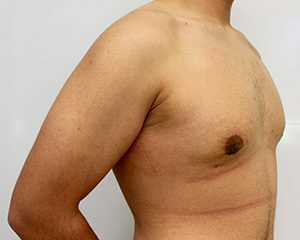 He required excision of his excess skin and tissue, and we discussed concealing his scars to create a more masculine appearance. 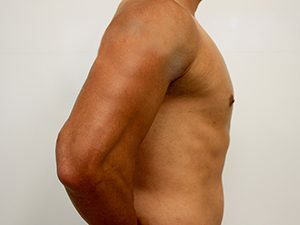 We performed a combined excisional procedure with VASER liposuction of the chest and axilla. We aspirated a total of 950ml of fat. 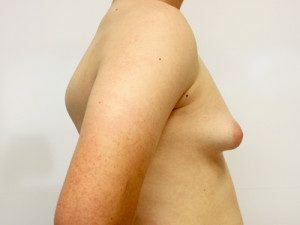 His results are shown only 2 months post-op. His weight is down to 208 pounds, and he is extremely pleased with his cosmetic surgery results. 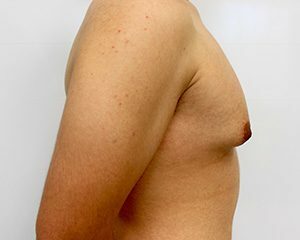 This 18 year-old man from the McAllen, Texas area presented to my cosmetic surgery clinic with concerns regarding gynecomastia. He is 6’2” and weighed 190 pounds. 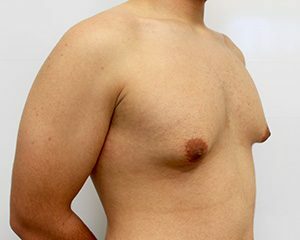 On examination he had moderate to severe skin excess with palpable fibrous breast tissue (Grade III – IV gynecomastia). 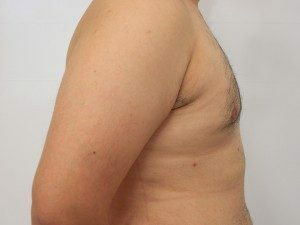 He was very self-conscious as a result of his gynecomastia, and he sought definitive treatment. 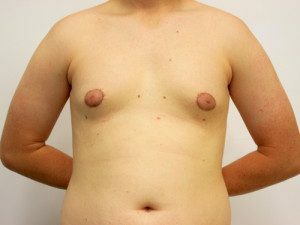 In addition, he desired reduction in the size of his areolas. 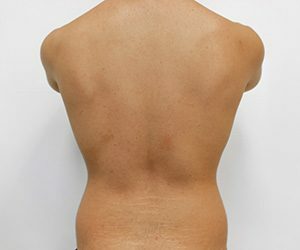 We discussed the fact that he was not a candidate for treatment with VASER liposuction alone. 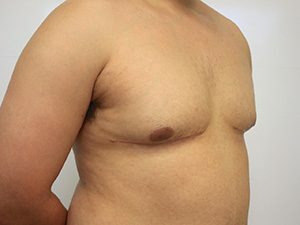 He required excision of his excess skin and tissue, and we discussed a circumperiareolar mastopexy (Donut Lift) to reduce the size of his areolas, conceal his surgical scars, and create a more masculine appearance. 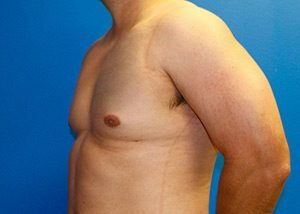 We performed a combined excision procedure with VASER liposuction of the chest and axilla. His results are shown only 6 weeks post-op, and he is extremely pleased with his cosmetic surgery results. 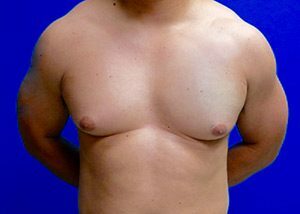 This 18 year-old man from the McAllen, Texas area presented to my plastic surgery clinic with concerns regarding gynecomastia. He is 5’9” and weighed 177 pounds. 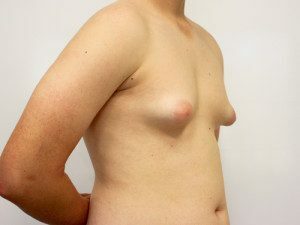 On examination he had mild skin excess with palpable fibrous breast tissue (Grade II gynecomastia). 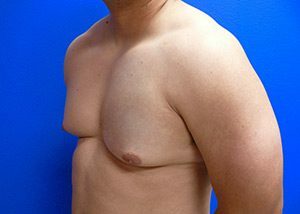 He was very self-conscious because of his gynecomastia, which was persistent despite his strenuous exercise regimen. He sought definitive treatment. 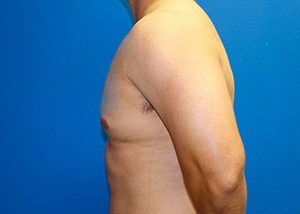 We discussed the fact that he was not a candidate for treatment with VASER liposuction alone. 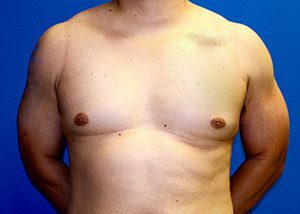 He required excision the dense breast tissue, and we discussed concealing his scars via a small peri-areolar incision. 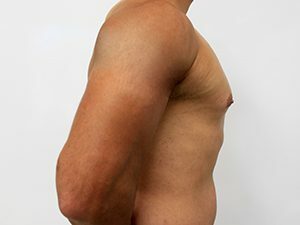 We performed a combined excisional procedure with VASER liposuction of the chest and axilla. We aspirated a total of 100ml of fat. 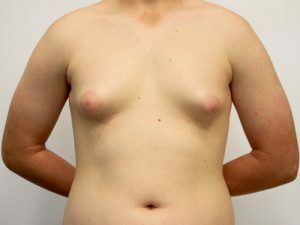 His results are shown only 2 months post-op. The VASER will continue to enhance his skin tightening and results over the ensuing 6 months. His weight is down to 175 pounds, and he is extremely pleased with his cosmetic surgery results. This young man from the Brownsville, Texas area presented to my plastic surgery clinic. 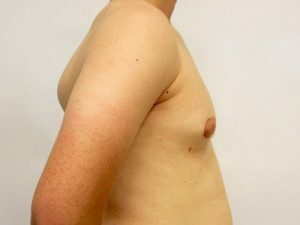 His primary concern was a pectus excavatum defect of his sternum. 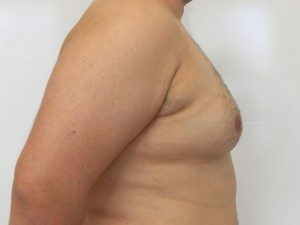 We treated this with pectoral implants and fat transfer to the sternum. 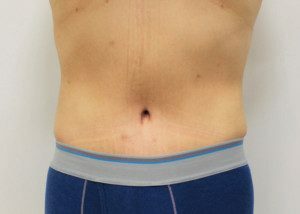 He also desired Laser Liposuction to the abdomen with Abdominal “Etching.” His results are shown at 2 months post-op and he loves his new look after his cosmetic surgery. 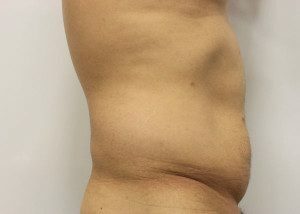 This 390 year-old man from the Mission, Texas area presented to my cosmetic surgery clinic for a tummy tuck (abdominoplasty). He is 5’5” tall and weighed 166 pounds. He had lost over 80 pounds after his gastric sleeve surgery and was unhappy with the loose skin around his belly. 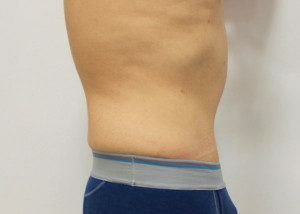 We performed an extended tummy tuck (abdominoplasty) with plication of his diastasis recti (tightening of her stomach muscles) and VASER liposuctions to his flanks and back. 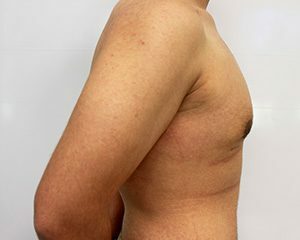 His results are shown 2 months after his surgery. His weight is down to 143 pounds and he loves his results. This young man from the Brownsville, Texas area had lost over 50 pounds over 3 months with diet and exercise. 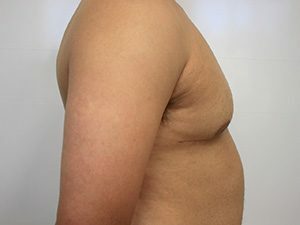 He desired skin tightening to remove the excess skin that failed to contract after the weight loss. We accomplished this with a full tummy tuck. 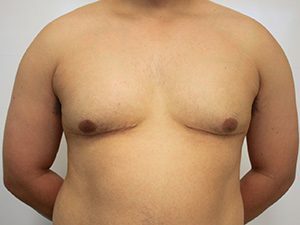 This 28 year-old man from the McAllen, Texas area presented to my plastic surgery clinic with concerns regarding gynecomastia. He is 5’8” and weighed 241 pounds. 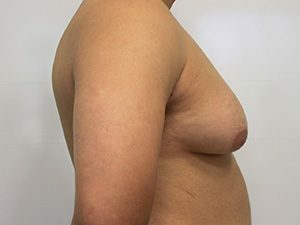 On examination he had no fibrous or dense breast tissue, and his pseudo-gynecomastia was primarily due to lipodystrophy of the chest and axilla. 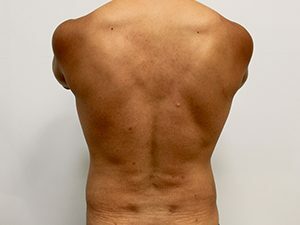 He was an excellent candidate for treatment with VASER liposuction. His results are shown only 2 months post-op, and he is extremely pleased with his cosmetic surgery outcomes. 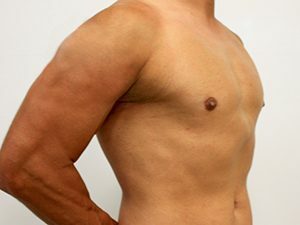 Male plastic surgery is very common and can be a great way to target those stubborn areas that are hard to correct. To learn more about the various plastic surgery procedure for men, contact RGV Cosmetic Surgery & Vein Center to schedule a consultation at our facility. We serve the residents of McAllen, Brownsville, the Rio Grande Valley, and all of South Texas.